A BRAND CREATED OUT OF A LOVE FOR TRAVEL, CULTURE, COMMUNITY AND HANDMADE GOODS. Souk and Soul a Lifestyle brand based in Washington, DC that is built around love for travel, cultures, handmade goods and connecting with people from all parts of the world. While on my sourcing trips, I look to collaborate with talented artisan and small businesses who I can design and create beautiful collections of handmade goods for you and your home. Our goal is to bring a sense of community and empowerment by providing ethically-sourced, responsibly-made goods from the artisans we work with in Morocco and the US. As a kid, my imagination knew no limits at the thought of traveling to the enchanting and distant places. I guess I have always had a spirit filled with wanderlust. Being an artist myself, I was fascinated with the handcrafted work as I would create and fill the rooms of my home with the distinct Moroccan colors and eclectic mix of finds from my travels adding to my creative vision. 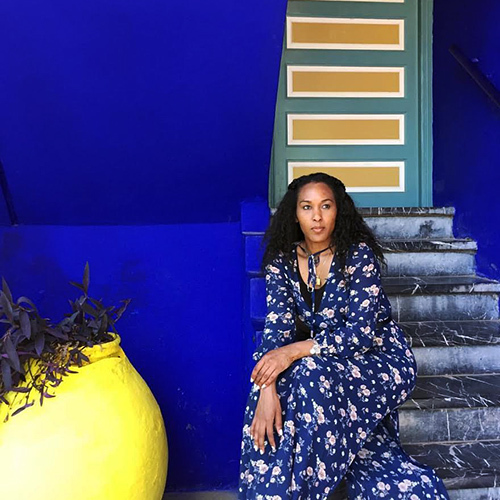 Since then, I have traveled to many places in the world, but I always envisioned myself visiting Morocco as I became more enthralled with its vibrant culture. I was fortunate enough to fulfill my dream in 2016, by traveling to this beautiful place and nothing can come close to the feeling of actually being there, witnessing the culture and skills of the artisans unfold before my eyes. The essence of the city was so awe-inspiring that my passion for travel, home décor and handmade goods grew even greater by bringing the traditional elements and using them in a modern design. Upon my return, I was eager to get Souk and Soul underway. I hope that each handcrafted item brings a piece of Morocco’s rich tradition into your lives just like it did for me. We believe that without the relationships we have built and the artisans who we work with this would not be possible, so we have started a program where we give back to the makers and organizations that build up the community as a direct investment into creating more opportunities for community empowerment. We invest a portion of proceeds directly back into artisan and organizations doing good within the Moroccan community and in the US.